These Chewy Oatmeal Cookies are the best oatmeal cookies ever! 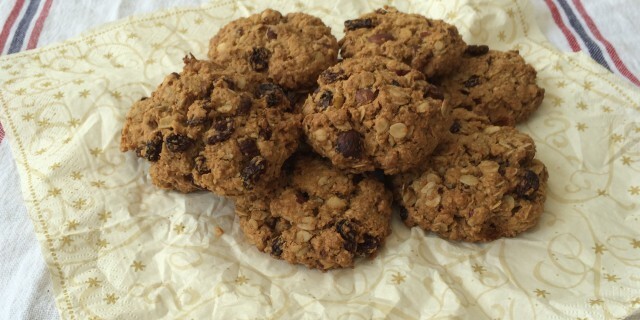 They are a such a great and easy healthy alternative to store-bought cookies. They are refined sugar-free, very quick to make and only contain natural ingredients. For weeks I have been baking many different batches to find the perfect cookie but these are the ones that made it across the finishing line. I love the fact that are gooey and chewy. The dough is a little on the wet side and I bake them just a little on the short side to make sure they stay nice and on the inside. After 15 minutes check to see if the cookies are ready. They should be firm but also soft. There’s an easy way to check if they are ready. When you place the top of your finger in the center of the cookies and give the cookie a little push, the dough should give some resistance but also spring back slightly. If you don’t like the cookies to be soft and chewy, simply bake them until they are firm on the inside. Combine the flours, oats, nuts, cranberries and salt in a large bowl. Melt the coconut butter and maple syrup in a small saucepan over gentle heat. Combine bicarbonate soda and 2 tbsp of boiling water. Stir the bicarbonate soda into the melted coconut butter-maple syrup mix until it starts to foam. Remove from heat and pour all the wet ingredients into the dry ingredients and mix well to form the dough. Roll the dough in small balls, and place them on a baking tray lined with baking paper. I have a small oven and I needed 2 baking trays to make 12 cookies in total. Leave plenty of space in between the balls. Use the palm of your hand to slighly flatten the balls. Cool for 30 minutes then enjoy. Store in an airtight container for up to 1 week.